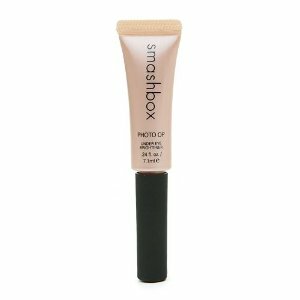 Photo Op Under Eye Brightener by Smashbox is devised to moisturize and brighten ready for concealer application. The formula comes in a tube with a brush applicator, similar to a lip gloss applicator. It helps to fight the ongoing battle most of us have with dark circles under our eyes with ingredients like vitamin C, red wine extract and peptides. Smashbox have also added marine collagen to help fill fine lines and wrinkles from under the eye area. This sounds like a good product that will give your eyes a little boost on those early mornings, so you can look awake even if you don't feel it. Well that it what its designed to do but does it actually work? Water (Aqua), Phenyl Trimethicone, Cyclopentasiloxane, Butylene Glycol, Isostearic Acid, Emulsifying Wax NF, Steareth 21, PEG/PPG 18/18 Dimethicone, Steareth 2, Magnesium Aluminum Silicate, Xanthan Gum, Sodium PCA, Squalane, Tocopheryl Acetate, Phenoxyethanol, Methylparaben, Ethylparaben, Butylparaben, Propylparaben, Isobutylparaben, Lecithin, Polysorbate 20, Sorbitan Laurate, Propylene Glycol Stearate, Propylene Glycol Laurate, Sodium Hydroxide, Sodium Hyaluronate, Glycerin, Steareth 20, N Hydroxysuccinimide, Chrysin, Palmitoyl Oligopeptide, Palmitoyl Tetrapeptide 3, Cholesterol, Capric/Caprylic Triglycerides, Diacetyl Boldine, Hydrolyzed Marine Collagen, Silanetriol, Glutamylamidoethyl Imidazole, Fructose Oligosaccharides, Porphyridium Cruentum Extract, Biotite, Vitis Vinifera (Grape) Seed Extract, Tetrahexydecyl Ascorbate, Polydodecanamideaminium, Triazadiphenylethenesufonate, Polyvinylalcohol Crosspolymer, May Contain (+/-): Mica (CI 77019), Titanium Dioxide (CI 77891), Iron Oxides (CI 77491, CI 77492, CI 77499), Carmine (CI 75470). Before concealer, apply Photo Op Under Eye Brightener under eyes with the brush applicator, then blend out using fingers. For a lifted and youthful appearance, highlight the inner corners of the eye and orbital bone. There was mixed reviews with this under eye brightener with some patrons happy with the dark circle coverage. While others found it too shimmery and didn't think it made any difference to their under eye area. Some users thought that at $18 it is slightly lavishly priced considering they found it more shimmery than effective. However, it did work for some patrons, so might be worth a try if you don't mind paying the high price tag. 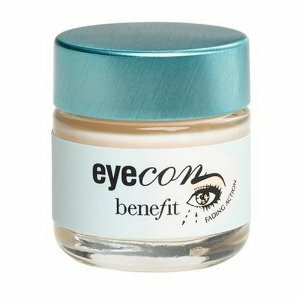 It has created an eye cream "Eyecon" that is supposed to help fight against puffiness, dark circles and fine lines. Well, although Benefit Cosmetics are usually very good, it should have left youth restoration to the experts! Sorry Benefit. Benefit Cosmetics was established in San Francisco in 1976. So really it is still a baby and we could see improvements in this product in the future. The only ingredients mentioned in this concoction are apple and sweet almond. If that's the key ingredients and Benefits biggest selling point for this eye cream, then I would rather save my money and smear fresh apple and almond under my eyes instead of buying this! Personally I find it very frustrating when a company doesn't supply the list of ingredients on its site. Especially when there are so many people with allergies that have to check these things. Most users seem to agree the cream is hydrating, a little goes a long way and they also like how it is unscented. Unfortunately it is let down by the fact that most patrons say it does absolutely nothing to reduce dark circles or fine lines. The only ingredients I found mentioned were sweet almond and apple fruit. Although most users found Eyecon ineffective a couple of people said it worked for them and reduced their dark circles and puffiness. Frankly this eye cream has come across as weak when put to the test in the field, therefor I think it is far too expensive at $30. Pure Caffeine Eye Cream by 100% Pure is made with organic coffee beans and other all natural ingredients. This cream has a pump dispenser which helps stop contamination. It can be used morning or night. This eye cream should help combat the aging process, help reduce puffiness and dark circles. I thought that too much caffeine was bad for skin. The science behind this is still new and while there is certainly an indication that caffeine has anti-aging properties, it's a bit early to tell if it works and if there are other side-effects which cancel the potential benefits out. Perfect scientific proof and consensus is pretty rare in the cosmetics industry so there's always a leap of faith and often you just have to try and find what works for you. If scientific jargon is your cup of tea (or cup of coffee in this case) then here's a study on caffeine and anti-aging. If you don't like the smell of coffee you might not like this cream because it has a strong coffee smell. Applying it at night might not be the best idea either if the smell of coffee makes you feel more awake. Reviews were very positive for this eye cream. Users said it actually worked on reducing puffiness, dark circles and fine lines. They also like how it isn't greasy and absorbs quickly. So while scientific consensus is lagging there is a consensus of it working among the majority of people using the cream. Green and White Tea (Organic), Black Currant Oil, Green Coffee (Organic), Vitamin E (A Tocopherol), Vitamin C (Ascorbyl Palmitate), Chamomile and Lavender Wax, Pure Vanilla Absolute, Extracts of:, Rosemary (Organic), Oregano (Organic), Thyme (Organic), Grapefruit Seed (Organic), Goldenseal (Organic). Using a tapping motion apply around the eye from the inner corner out to underneath the eye brow. Avoiding the eyelids. The ladies that used this cream said it reduced dark circles and puffiness from around their eyes. 100% Pure Caffeine Eye Cream is only $19 (1oz), cheap for an eye cream considering most are at least $30. Vasanti Cosmetics was founded by three Canadian woman in Toronto. They wanted to create products that would suit all women and their different needs. 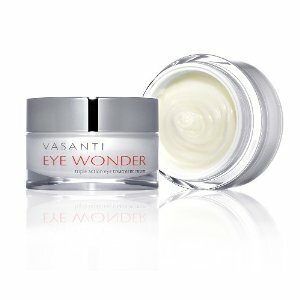 Eye Wonder Triple Action Eye Treatment Cream has Peptides and Botanicals that are formulated to reduce dark circles, puffiness and fine lines. These active ingredients combat these problems even if it is hereditary or just the aging process, says Vasanti. This cream is suitable for all skin types and should be used morning and night. I have never heard of this company before, I have taken a look at the web site and the products look quite promising. I couldn't actually find any bad reviews on Eye Wonder. It is quite a new product though. Dermican, Eurol, Bt Haloxyl, Eyeliss, Matrixyl 3000, Phytelene 773. Apply morning and evening for the first month then just once a day for maintenance. Gently dot around the eye from the inner corner out to the under part of the eye brow. This ensures no tugging which can cause fine lines and lost elasticity. Ladies who have used this eye cream only had good things to say about it. They say it actually reduces fine lines, puffiness and dark circles. At $42 for a 20ml jar it is quite pricey, but what eye cream isn't now days! If its within your price range if could be worth a try as all the ladies that have reviewed it found it worked for them. Korres Evening Primrose Eye Cream has been formulated to reduce the sign of fine lines and dark circles. It also contains an SPF 8 which is a huge plus in my books. Sun protection plans a big part in the defense against premature aging. This cream can be used morning or night. The primrose and vitamin C extracts help reduce the loss of moisture from around the eye area, they also help stimulate collagen synthesis. Which should help plump skin whilst eradicating fine lines, says Korres. I'm not sure how primrose has any thing to do with reducing the loss of moisture in skin. Primrose is used medicinally as a decongestant. I can't find any proof of it helping to reduce moisture loss. However, Vitamin C is proven to be good for the skin and helps stimulate collagen synthesis. Evening primrose, vitamins K1, C, E, provitamin B5, Ruscus extract, Zinc oxide. Apply cream morning or evening (evening is best) around the eye area. First apply on the lower lid, from the inner corner out use a gentle tapping movement, then up around under the eye brow. Avoid the upper eyelid. The eye area is very sensitive so be gentle, pulling the skin could course more fine lines. Most users commented on the price being a lot cheaper than most other eye cream, costing a reasonable $38. Many found it helped to reduce their dark circles around the eye and like that it contains a SPF 8. A few ladies do say it would be better if it was more firming. 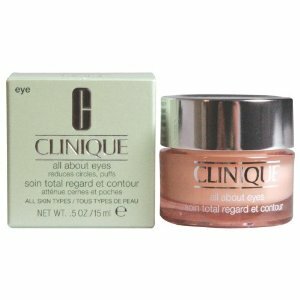 This eye cream might be better suited for ladies that don't require the firming action as much. You are currently browsing the archives for the Eye Creams category.